NFL owners voted Tuesday night to agree to a rule proposal that allows for the review of offensive and defensive pass entrances, including no calls. Coaches can challenge these calls in the first 28 minutes of each half. In the last two minutes of each half, these calls are subject to a state examination. This rule change only applies to the 2019 season. The owners have passed the provision with 31-1 at the Annual League Meeting on Tuesday night in Phoenix. The Cincinnati Bengals were the only team that voted against voting replay reports, sources said, Mike Garafolo of NFL Network. Coaches still have only two challenge flags. This decision comes one day after New Orleans Saints coach Sean Payton said that the Competition Committee had approved an amended Rule Change Proposal (6B) in which the coaches could have the opportunity to intervene against the offensive to deny the defensive pass even if this was not the case flag at stake. 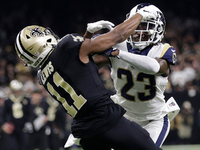 The rule change passed on Tuesday night is considered 6 C.
The pass check and non-call verifiability came to the fore after the NFC championship game in January when Nick Robey-Coleman of Los Angeles Rams met with Saints recipient Tommylee Lewis had early a third down play in the third quarter. No penalty was required for the game. The Rams won the game and made the Super Bowl. The aftereffects led to the indignation of Saints fans, coaches and brass, including owner Gayle Benson, who went so far as to publish a statement on non-appeal. On Tuesday evening, Benson celebrated the rule change. "That's what I wanted, so I made my statement," Benson told reporters, NFL network insider Ian Rapoport "[The non-call in the NFC title game] will never happen again." "We think it was a good change," Payton told reporters. "We're trying to fight the two fouls that have the most impact on the games … The coaches of the last three years are a little more sensible with their challenges, I think that will be especially the minor fact that they are now one have more meaning, continue to play that you can challenge. "South of two minutes it is in the hands of the replay, but north of two minutes it is in your hands. I think it will not take back the way we see a game. I just think that there are only two more calls. The one-year rule change was not just about satisfying the ailing saints, NFL Commissioner Roger Goodell told reporters that it was important for the teams to agree to extend the retake meeting. "Personally, I think it was the fact that every club wanted to get something, and the league wanted to make those games right," said Goodell at a press conference immediately after the poll. "Repetition is to get it right." And ultimately I think people are compromised from long-held beliefs because they want to make the system right, they want to get the game right. " The owner's mandate to approve this replay review extension is surprising. Already at the beginning of the annual league meeting, the approval of the review of pass interference calls as a "non-starter" in the competition committee was reported by Rapoport. Trainers were reportedly the driving force behind a more in-depth consideration of the proposed rule, namely Payton, Cowboys coach Jason Garrett Patriots coach Bill Belichick and Chiefs coach Andy Reid: The two latter advocates allegedly pleaded for a meeting between coaches and the Competition Committee on Monday evening to review and then change the original proposal. [More] 19659002] "Replay has an important tool for us. It was unable to correct something that we wanted corrected in the past. That was the driving force for me at the end of the day, "said Goodell. Our job is to get them right and we should use all available means to get them right. Repetition is a great way to do that.